Qatar Masters also known as Commercialbank Qatar Masters is an European Tour golf tournament played at Doha Golf Club in Qatar. It was established in 1998. A complete informtion regarding Qatar Masters is given below like - History of the tournament, prize money of the tournament, etc. Qatar Masters is a professional golf tournament which was established in 1998. It is a European Tour golf tournament having prize money of 2.5 million US Dollars in 2011. The Qatar Masters is a Stroke play format golf tournament and played at Doha Golf Club which is 7,388 yards in length. In 1998, the inaugural edition of the Qatar Masters was played which was won by Scottish golf player Andrew Coltart. Andrew Sherborne and Patrik Sjoland were the runners-up of the inaugural event. 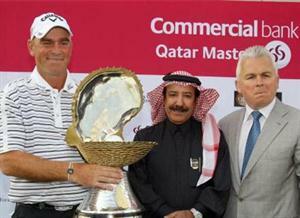 In 2006, the name of the tournament changes to Commercialbank Qatar Masters, due to sponsorship reasons.